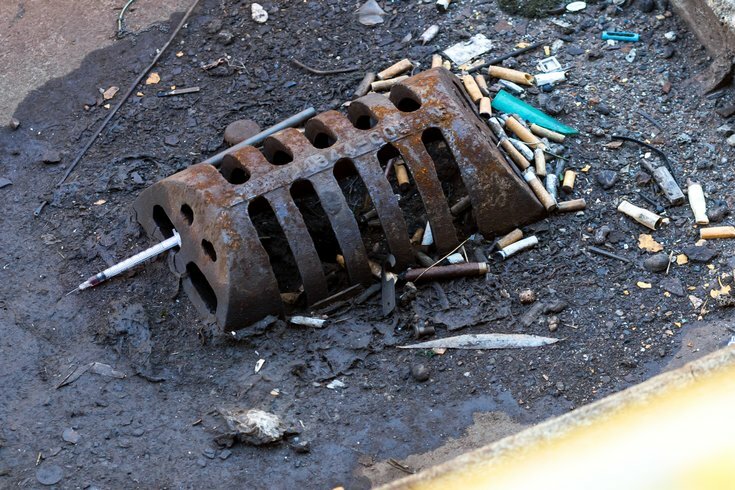 A syringe, cigarette butts and other debris near a drain on the elevated train platform of the Market Frankford Line. Philadelphia's opioid crisis is not showing any immediate signs of a slowdown. In fact, the toll looks to be rising, according to statistics released Tuesday by the Department of Public Health. Records from the Medical Examiner's Office confirmed a total of 1,217 unintentional drug overdose deaths in Philadelphia in 2017, a 34 percent increase over the 907 deaths in 2016. Opioids were found in 88 percent of those 2017 cases, up from 80 percent the previous year. What's next for 'safe injection' sites in Philadelphia? Most of the increase was driven by the rise of the deadly synthetic opioid fentanyl and its related analogs, which were found in 846 of last year's overdose deaths. That marks a 95 percent increase in fentanyl-related deaths over 2016. “We are experiencing a tragedy far surpassing the AIDS epidemic at its worst," said city Health Commissioner Dr. Thomas Farley. "This crisis has happened because of decades of over-prescribing of opioids, combined today with the delivery to Philadelphia’s streets of cheap, pure heroin and fentanyl." Opioid-related deaths rose across all demographic groups in Philadelphia. The most dramatic annual changes were found in men (60 percent increase), Hispanics (60 percent increase) and people aged 35-44 years old (65 percent increase). A geographic analysis of overdose deaths found that they present in neighborhoods throughout the city, with new hotspots emerging in South Philadelphia, Northeast Philadelphia and West Philadelphia. The report comes as Philadelphia doubles down on its strategy to combat the opioid crisis, planning a mobile overdose response team and safe-injection sites for those dealing with addiction. A city task force created in March made 18 recommendations to slow down the epidemic, nearly all of which are currently being implemented. "We must turn this crisis around by getting physicians to prescribe opioids less, helping people who are addicted to opioids get treatment, and using the antidote naloxone to prevent fatal overdoses,” Farley said.